I have had Westport Rivers Brut from the Westport Rivers Winery in Massachusetts three times served semi blind (I knew it was one of four glasses in front of me) both with other US sparkling wines and Champagnes and it has never failed to impress. And as is often my tradition, I am enjoying a glass as I write this up. Thanks to Kent and Kevin at Blanchards in Allston Massachusetts for turning me on to this (and many other) wines! The Westport Rivers Winery is in southeastern Massachusetts, a bit below Cape Cod, and part of the "Southeastern New England Wine Growing Appellation" which admittedly I've never heard of until a couple of minutes ago. There is actually a Coastal Wine Trail that eclipses 9 wineries, from Truro near the tip of Cape Cod to Southern Rhode Island, and the wineries welcome visitors. Westport Rivers was established in 1982 and is run by the 4th generation of a family of winemakers, who chose the South Coast of Massachusetts because of its promising Terroir. The soil is damp and rich and on well drained gravel. The climate is cool and by of the gulf stream which moderates in weather. They make a number of wines including a Pinot Noir, Pinot Noir Rose, Pinot Gris, two Chardonnays, Reisling, a fortified wine and more. They ship (as of this writing) to almost half the US states and are available in wine shops in several as well. Wines range from about $15 to $45. They make two sparkling wines. 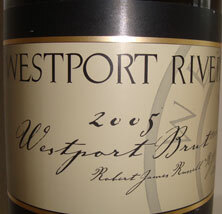 One is a vintage wine called the Westport River Brut "Robert James Russell" which sells around the US$28 price point. It is made by the traditional Méthode Champenoise and is a blend of Chardonnay and Pinot Noir. The second is a very dry Blanc de blancs (meaning all Chardonnay) called the Westport Rivers Blanc de Blancs which sells for around US$30. It is aged for 7 years on its lees (dead yeast and other precipitates) and the current vintage as of this writing is the 2000. Winemaker Bill Russell suggests this with oysters. Westport Rivers has an informative Web site which includes an online store. A medium and meaty colored yellow with fine bubbles. On the nose, fresh baked bread, faint apple, some minerals, and even a hint of chalk like Champagne. Others have also commented on the chalk. Bright apple, some pineapple, cherry, very lush, mouth filling, and happy. Very bright yet exceedingly well balanced. The nose is drier and more minerally, and the palate more bright fruit, but it comes off as very well balanced indeed. Tasted multiple times with similar positive notes. When drank in a lineup of other American sparklers, this seems less fruity and "New World."